Greetings, dear readers! I hope this post finds you well and that your week has been off to a wonderful start! I've been on autopilot for the past week or so as I have managed to get sick yet again and just have too many things to do in just about every aspect of my life. Thankfully, this time I only a simple cold, so while the head fuzziness and general bleh feeling isn't ideal, I'll gladly take this over the crazy illness I had last month! Because I have the head fog going strong still, please pardon any typing errors that likely will find their way into this post. I just have too many things in the queue that need to be shared to just wait it out any longer. It may not be feeling like Spring for many of us right now, but it's still a great time to be thinking of the season and all the bright and beautiful shades that come along with it! 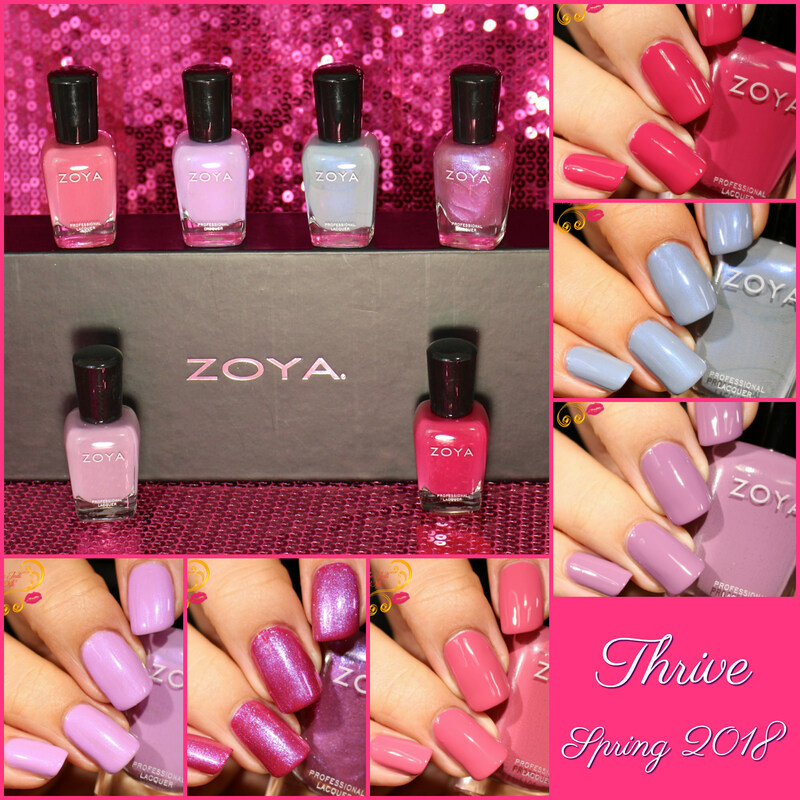 For today's blog post, I have the new Zoya Thrive Collection to share with you. This six-piece collection consists of three new creams, two shimmers, and a sheer shimmering flecked-filled topper. Let's get a closer look at each of these nail polishes! Trudith is described as a muted, wisteria purple cream polish, and I adore this colour! Muted purples are some of my favorite shades for when I want something a little more neutral but still sport a little bit of colour. The formula of this polish was fantastic as well! It is a little thinner than the indie polishes I often wear, but it still applies beautifully to the nail without any issue. I used two coats to opacity for these photos. Zoya describes Monroe as a glamour pink cream, but even I have to admit I have no clue what defines "glamour pink". It has a little too much of a red lean for me to call it a magenta and is closer to a raspberry pink. This is such a great vibrant hue for spring that carries over so well into summer. I suspect this beauty will be seen on many toes wiggling in the sand or lounging by the pool! Monroe is a little less pigmented and has more of a jelly-like texture, but it applies flawlessly to opacity in two to three coats. I used two coats for these photos, but those with longer nails or who paint in very thin layers likely will need to use a third. Haruko is described as a soft, violet metallic polish, and it is the closest to a pastel shade found in this collection. While this type of colour isn't quite my preferred colour, it is definitely a pretty shade that will surely win over many people! The formula is a little on the thinner side so you may need to add an extra coat, but it does make the application easier than with many other pastel formulas! I just barely got away with using just two carefully applied coats to achieve opacity, so I would mentally prepare to use two, if not three, coats. Brandi is described by Zoya to be a blush pink cream. I suspect my subconscious is talking to me with all the rainy, cool weather we've been having lately as I cannot help but think about watermelon when I see this polish! It is such a great warm pink hue, and the formula is on point! I used two coats for opacity for these photos. With all the pink-type varieties in this collection, Darby is an awkward outlier in this collection for me. Described as a dusty, gull gray metallic, I don't find that it fits with the remaining five shades. That being said, I love this colour and am glad to see something a little different join the lineup, even if it does stick out. The gray base with blue shimmer is truly the most perfect match, and the final result is almost a slate blue on the nails. The formula of Darby is slightly thicker than the rest of the shades in this collection, but it is by no means thick or difficult to apply. It applies like a dream with two coats to opacity for these photos. Leisel is the topper contribution to the Thrive Collection. Sparkled with a slight hint of pinky-purple, this polish is gorgeous over the cream bases in this collection! Leisel paired with Monroe is my personal favorite, but the other pairing are stunning as well! Check them out! When partnered with Trudith, the final result is soft and delicate. While this isn't a look I gravitate towards often, I can certainly see wearing something like this at a wedding or paired with something ultra feminine. Here is a look at Leisel over Brandi, the third cream nail polish shade found in the Thrive Collection. As you can see, Leisel plays beautifully with these shades as a topper! I used a single coat over each of the base shades, and Leisel adds the perfect amount of sparkle with just one layer. While it was designed to be used as a topper, you can definitely build it up to opacity on its own if desired. For my own personal use, I prefer it as a topper, and I'm looking forward to playing with it over other shades! The Zoya Thrive Collection has already launched for purchase and can be found at Zoya.com. Each of these shades retail for $10. Do you have a favorite nail polish from this collection? I'd love to hear which one is your favorite! Monroe and Darby are my faves of this collection! Can't wait for their next sale to pick them up! I love all the shades especially with the top coat! I really loved their cremes this round. So amazing. Darby and Haruko are my favorites! I love that strong shimmery topper, too. So good! I love Brandi on you! These are all gorgeous! This whole collection is fun. I love the 2 shimmers, but all your swatches are great. Haruko and Brandi are on my wish list! I really love Darby and Haruko! I am so in love with the collection this year!! Zoya always wins my heart with Spring but this one is just amazing! I love them all!